Prine still deploys traditional chemicals when required, such as when disinfectants or sanitizers are requested by a facility. However, these are used with electrostatic technology, which puts a positive charge on the substances, resulting in a very controlled and targeted application and also uses less product, he says. And in some cases — such as trying to get the residue from snow, ice and other inclement-weather out of carpeting and flooring — traditional chemicals may provide the best option. 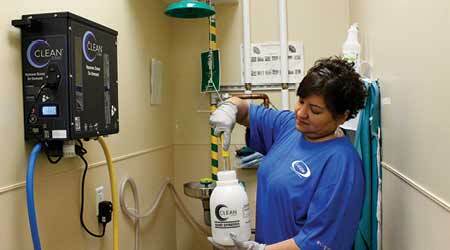 When an EPA disinfectant or sanitizer is requested, team members identify the high-touch points, tackling these first with the engineered water and then following up with the chemical product. But these situations aside, team members rely on engineered water for cleaning all surfaces. Team members fill up the Caddy — mainly used in restrooms but it can also be used for carpets and hard-floor surfaces — with cold tap water and then roll it into a restroom. It plugs into any socket. The cart, which holds 12 gallons, turns the cold tap water into the aqueous ozone; team members dispense the solution on toilets, urinals, partitions, floors and other surfaces, through a low-pressure application wand, thoroughly cleaning the areas and forcing the debris from high to low in the restroom. Any debris that has been released onto the floor is collected via the onboard vacuum system. Once the 12-gallon debris tank is filled, the material is released through a hose into a toilet or mop sink. A team member also uses a pressurized spray bottle for general-purpose cleaning, spraying the solution onto a microfiber towel, which is then used to wipe fixtures, tabletops, desks, glass, chairs, countertops or other surfaces throughout the facilities. Although the cleaning procedures stayed the same, a certain amount of training was still required. Because it is preservative/additive-free, engineered water doesn’t have a long shelf-life, says Prine. Consequently, team members had to be aware of this and be certain to always have active solution when cleaning with the pressurized spray bottles. The engineered-water solution is good for approximately three hours. After this time, the nanobubbles in the bottle start to dissipate. Team members then pour the remaining water into the fill tank onboard the Caddy, filling the pressurized spray bottle up again from the Caddy. Consequently, retraining was important, says Prine, particularly since team members were initially skeptical that engineered water would actually deliver the promised results. Also, it was a change, and people are notoriously resistant to change.